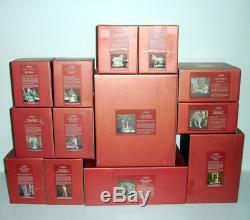 Lenox Little Town Of Bethlehem 15-PIECE COMPLETE SET OF NATIVITY FIGURINES. New condition in 13 boxes, includes. Holy Family (3-Piece Set) - Angel with Trumpet. Oasis with Trees - Standing Camel - Pair of Sheep. Little Town of Bethlehem is among the most beautifully crafted Lenox Nativity Collections, an inspiring reminder of the true meaning of the Christmas holiday. Each porcelain figurine is intricately sculpted. In glossy and matte finishes and. Hand-painted in beautiful tones and gilded trim to accentuate its fine detail. 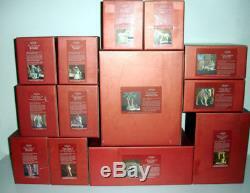 This entire collectible set makes a treasured heirloom or gift, each figurine or set. Comes packaged in a sturdy box that doubles as a safe storage box New condition in original boxes, old store stock, never used or displayed, packaging may show some scuff marks and/or color loss from stacked storage. Please Note: This is a set of 15 pieces. Set includes 13 boxes as shown in the first and third photos. There were 12 pieces that came in individual boxes (3 kings, angel, shepherd, donkey, lamb, camel, well woman, well, tree, and manger). The family (Mary, Joseph & Baby) came together in one box for a total of 15 pieces. The second photo in the listing was a stock photo from Lenox that was issued before all of the individual pieces were designed. Looking at the second photo you do not see the donkey, the lambs, the woman at the well, or the well (but they are included in this listing). All of the other pieces are shown in the photo. Products may be opened for photo and/or inspection , Items will be safely and securely packaged. Pictures may not reflect true colors due to various lighting conditions. The item "Lenox Little Town Of Bethlehem Complete 15 Piece Nativity Figurine Set New Boxed" is in sale since Monday, February 12, 2018. This item is in the category "Collectibles\Decorative Collectibles\Decorative Collectible Brands\Lenox\Figurines". The seller is "stop2shop18" and is located in East Brunswick, New Jersey. This item can be shipped to United States, Canada, United Kingdom, Denmark, Australia, Japan, Thailand, Belgium, France, Netherlands, Germany, Switzerland, Cambodia.